"In the world of session styling I’m always looking for new ways to change the models hair. Wild crazy colour became the new hot thing but you cant just colour a models hair just because you feel like it. I wanted full on colour but without the commitment! I had had my share of moments where I wanted crazy colour hair on a Friday, but come Monday morning I didn’t want my crazy colour anymoreI want to be able to put it on and just as easily take it off. I thought to myself why cant hair colour be just as easy as applying make-up? I had been experimenting with pigments since the 80’s obsessed with the powdered wigs of the French Revolution. The influence came from those times but I wanted it to be intense and almost fluro as it is the intense flash of colour that makes it modern. COLOR.BUG is wipe on, wipe off colour! It’s just for fun and just for the one night. With a towel draped around your shoulders to protect your clothes, I would apply a hair product and then the COLOR.BUG to make it stick. 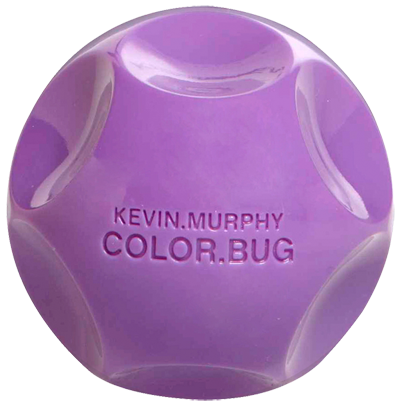 The COLOR.BUG adds body to hair, you can keep this raw texture or add a fine mist of hairspray to lock on the colour. Avaliable in Pink, Purple and Orange"
Have to watch this podcast!! !